All those who are born are bound to eventually die. We live on borrowed time. A friend once said that everything can be made up except time. Once it passes, it is gone. What are we on earth for? For a man like the late Congressman John Dingell, it was to be a public servant, to serve others and to make a difference. People like the late John Dingell live on forever in our memory for making a difference in the lives of many people. I am one of these people. My community also was greatly helped by Mr. Dingell. John Dingell, simply put, was a good human being. From a good person you can make a good anything and Dingell decided to be a good representative of his district. He had a passion to work with people and people from all backgrounds-faiths, national origin, nationality, color, race and gender found him approachable and found themselves treated by him with dignity. His door was always open to help others. He helped me personally during the darkest chapter of my life. Getting my green card was a struggle. I was one of the people in this country that had to fight the federal government to get my green card. I was married with children and struggling to keep my family intact. Many people stood by me during that hard time. One of the people who helped me most was Congressman John Dingell. I wasn’t a citizen, I couldn’t vote for him, and I wasn’t a campaign donor. Still Mr. Dingell understood the humanitarian nature of my case and the injustice I was facing and helped me get due process rights. During my long immigration ordeal, Mr. Ismail Ahmed, founder of ACCESS and CEO of ACCESS at the time, called Congress Dingell and requested his help to end the unfairness and the injustice that was imposed on me. Mr. Dingell did not know me personally at the time. However, when he realized the injustice inflicted on my family, he took action and his action paved the way for further legal proceedings that ended in my winning my immigration odyssey and ultimately becoming a US citizen. John Dingell saved my life and my future. I am forever indebted to him. I have always been an activist. I have been involved in the nonprofit sector for decades helping others. I have had many encounters with John Dingell over the years. We both attended community events. He was always approachable, friendly and courteous. He appreciated my activism and made sure that it was recognized. One of the most cherished gifts he gave me was an American Flag that was flown over Capitol Hill in my honor. It was gift he gave me when I became a US citizen. 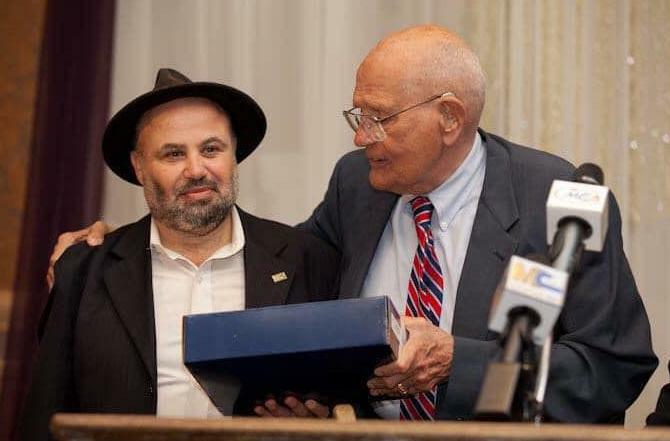 Not only was Mr. Dingell there during the most difficult chapter of my life, he was also there during the most difficult chapter in the life of the Arab American community in the United States. I recall the terrorist attacks of 9/11 and the fear and anxiety that gripped the Arab and Muslim American communities throughout the country including in the Dearborn area. The Dearborn area became the center of national and international media attention. It became also the center of attention for law enforcement agencies as the capital of Arab America. Dearborn is the city with the highest percentage of Arab Americans in its population. The government thought there might be other attacks, sleeper cells and that the Detroit area is the place to hide for terrorists who want to harm the US. It was not the good kind of attention. John Dingell and his wife Debbie Dingell, the current House representative, made sure to let the community know that they stood by it. We owe the Dingells a lot. It is during the time of crises that you know the true nature of people. And the Dingells were true friends of the Muslim and Arab communities. The Honorable Mrs. Dingell remains a true friend and advocate for all the people of the district, including her Arab and Muslim American constituents. Words can’t describe that challenging time and how complicated it was. Hard to describe the fear. Some Arab and Muslims Americans were selling their homes and leaving the country. It was the Dingells who were front and center defending the community and demolishing myths about Arabs and Muslims. Congressman Dingell and Senator Carl Levin advised me and encouraged me as a community activist and advocate to pursue open and direct dialogue with the US attorney’s office and federal agencies. John Dingell helped make the needed connections and opened doors for such dialogue to proceed through BRIDGES. BRIDGES, Building Respect in Diverse Groups to Enhance Sensitivity, is a law enforcement-community forum that I co-founded with former US attorney Jeffrey Collins and that I co-chaired for thirteen years. BRIDGES became a model for law enforcement-community engagement and was discussed in academic conferences. Mr. Dingell deserves a big part of the credit for the establishment of BRIDGES. On the 10th Anniversary of the establishment of BRIDGES, Mr. Dingell presented me with another American Flag flown in my honor, expressing support to this model of dialogue. The media always report that Americans don’t trust government, that Americans hold politicians in low esteem. But not all politicians are the same, just like not all lawyers or medical doctors are the same. Mr. Dingell was a good man and a good politician. He cared deeply about people and wanted to serve the public good. In words and deeds he cared about me and my community. Rest in Peace Honorable John Dingell.